EAB seeks to engage students from all walks of life through a variety of campaigns that address various aspects of the environmental movement. All of our campaigns are student-initiated and run. If you have an idea for an environmental campaign, EAB can provide the support and resources to make it a reality! EAB’s Zero Waste and Thrift Store Campaign focuses on promoting a less wasteful lifestyle that will help UCSB reach the UC-wide goal of Zero Waste by 2020. Since Winter 2017, we have hosted a quarterly Pop-Up Thrift Store to reduce waste and educate students about the difference they can make by purchasing used items. We have donation bins set up in most of the Residential Halls and at the Pardall Center, so drop off your old clothing in these bins! Check our Facebook page for more details on the Pop-Up Thrift Store, and learn zero waste tips from the campaign director! We are assisting the county on implementing its new mandate which requires restaurants that produce more than 50 pounds of pre-consumer waste to compost their pre-consumer waste. Pre-consumer waste is any organic waste the consumer never touches, like banana peels and strawberry leaves. 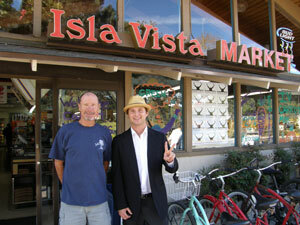 Currently, we are gathering information from Isla Vista businesses and planning to conduct a waste audit. So far, 3 businesses have joined the program: HiWi, Sorriso Italiano, and Buddha Bowls. The Renewable Energy Campaign is focused on implementing LED lighting, green roofs, as well as continuing the Environmental Affairs Board’s journey in solar energy on campus. We are focusing on making student-funded buildings on campus, like the Recreation Center and University Center, more energy efficient. Finally, we plan to work with other campaigns and organizations, such as the “Take the Stairs” Campaign and LABRATS, and encourage students to take courses related to energy use to promote sustainability and awareness within the UCSB community. We are campaigning to have UCSB create a more robust Office of Sustainability. Currently, the UCSB Sustainability program operates under a temporary budget, and the staff are running the program alongside other duties. Having an official Office of Sustainability with a set budget and dedicated, full time staff would allow the campus to better meet its sustainability goals and properly train our students for the future. The University of California invests millions of dollars in the fossil fuel industry. By investing, the University of California not only takes partial responsibility for but also supports fossil fuels. Yet climate change is accelerating. The National Academies of Science affirmed that anthropogenic climate change represents a crucial challenge to the future of humanity, with a current 150,000 annual deaths and $1.2 trillion in annual economic losses. The extraction and burning of fossil fuels have been shown time and again to not only be linked to climate change, but also to pollution, environmental degradation, public health crisis, and natural disasters. The science is clear: we cannot safely burn fossil fuels without continuing to increase the global temperature and emit dangerous levels of carbon dioxide. EAB’s Fossil Free Campaign is raising student, faculty and staff support and awareness about the issue, as well as working with other UC’s. The campaign ultimately aims to get the UC Regents to divest the money in the endowment pool away from 200 publicly traded companies, which make up the largest portion of the fossil fuel industry. Here are the best ways to contact them. In the Spring of 2011, AS Legislative Counsel passed the “Green Bill”, a resolution to promote sustainable practices within Associated Students by bringing environmental consciousness to the spending of student funds. The bill requires that at least half of all money allocated to food and supplies be used to buy “sustainable” products. In addition to proactive spending the Green Bill also targets passive spending habits by requiring the promotion of energy conservation techniques in student government offices. EAB launched a campaign to increase awareness of the Green Bill creating the Green Consultant position on our core group of officers. The Green Consultant is responsible for publicizing the Green Bill to other Boards, Councils and Commissions and provides a resource for student groups that are unfamiliar with environmentally friendly practices or are looking for new ones. Check out the Resources tab to read the full text of the Green Bill itself. We worked with local businesses to develop creative answers to climate change in socially, environmentally, and economically positive ways. From providing energy retrofits to Isla Vista stores, to working with campus policy makers to make environmentally-sensitive investing decisions, to searching for a solution to the plastic bag problem, we are always on the lookout for fresh and interesting ideas from students to make local commerce more sustainable and equitable. Some events have included Isla Vista CarrotMob and The Evolution of Man and Bag. EAB was also involved with the development of the Investment Advisory Committee’s Sustainable Investing Analysis and Report, which can be downloaded here. This campaign’s goal was to educate the student body about the importance of water conservation and to improve water use practices on campus. The educational campaign addresses the amount of water that is used and wasted each day in our area and on our campus, as well as statewide, nationwide, and even globally. Campus project goals include the installment of timed showerheads in the dormitories and water purifiers on the water fountains, the extinction of plastic water bottles on campus, and the replacement or modification of campus irrigation systems. Remember that conserving water is just as important as conserving energy! We work to raise awareness about the negative environmental, health, social, and animal welfare impacts of meat consumption, and we educate students about the tremendous benefits of cutting out meat from their diets one day a week (or more!). Meatless Monday is part of a national movement to improve the health of people and the planet. Our newsletter will tell you about our activities, give you updates on our campaigns, and provide information on internships and job opportunities.